In a large enameled cast-iron casserole, heat the oil until shimmering. Add the shallots, jalapeño, garlic, ginger and a generous pinch of salt. Cook over moderately high heat, stirring, until softened, about 3 minutes. Stir in the crushed red pepper and cook for 30 seconds. Add the wine and simmer until reduced by half, about 5 minutes. Add the stock, brown sugar, fish sauce, coriander, cumin, turmeric, cinnamon and lime leaves and bring to a boil. Stir in the pork, cover partially and simmer over moderately low heat until the pork is nearly tender, about 25 minutes. Stir in the potatoes, cover partially and simmer until the pork and potatoes are tender, about 20 minutes. 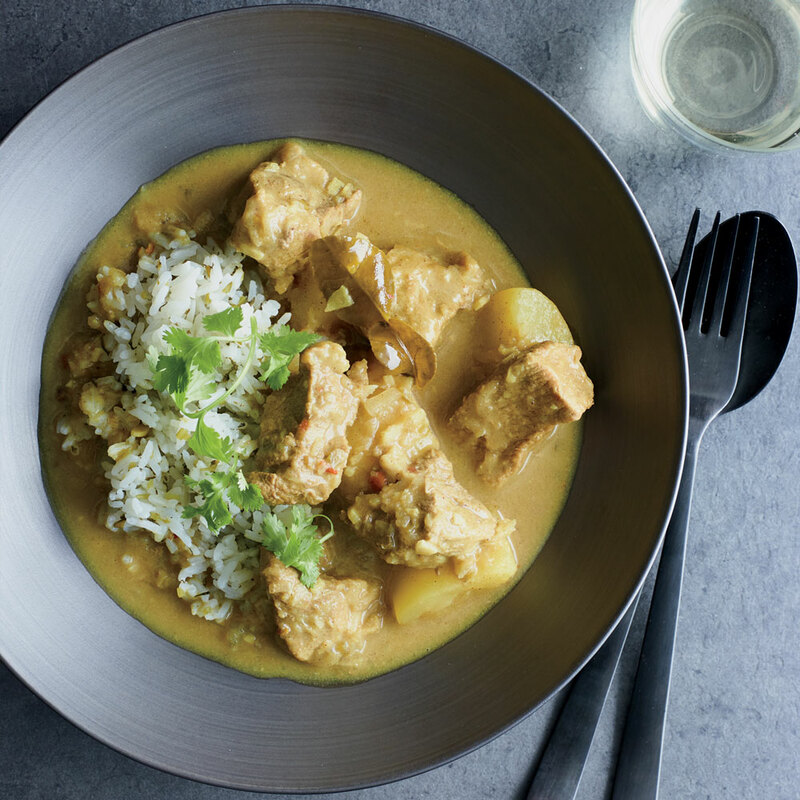 Stir the coconut milk and lime juice into the curry and bring to a boil. Season with salt. Discard the lime leaves. Garnish with cilantro, mint, Thai basil and sliced scallions and serve with steamed rice. The curry can be refrigerated overnight. Reheat gently before serving. Review Body: Comforting, luscious flavor profile. This becomes one of those comments where the ingredients had to change a bit; sorry. We can't handle that much heat, so I cut the jalapeño in half and the crushed red pepper down to a little less than 1/2 teaspoon, though I did add freshly ground white pepper at the end. In the interest of health (a necessity for us), the pork shoulder turned into leaner pork loin (cook for half the time of shoulder), sweet potatoes took the place of white, the coconut milk went lite, and the white rice became brown. No loss of taste, texture, or happiness; I think I saved the integrity of the dish! A fun and simple meal with 6 generous servings. THANKS!